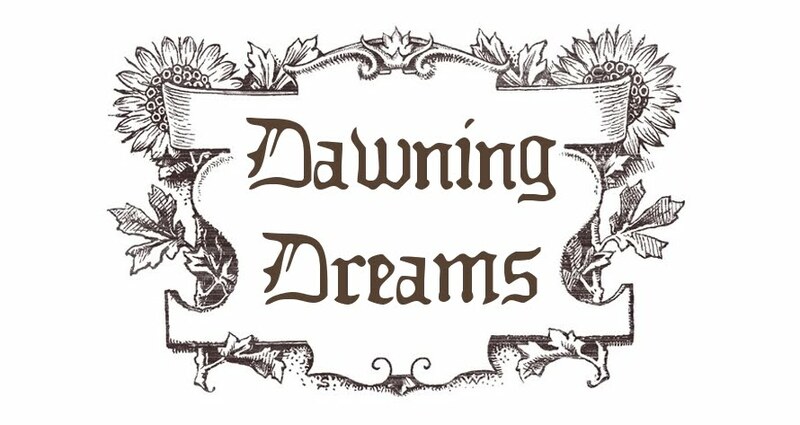 As many of you may know, I have an Esty store called Dawning Dreams Etsy Shop. 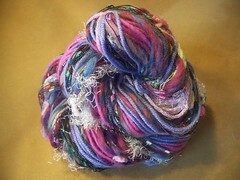 I sell knitting, spinning, & crochet yarn and accessories. Many of the items you see are the final products of several endeavors to make a great product. You should see the pile of dead stitch markers I have in a jar that didn't make the cut. Recently, I decided to take on the task of creating a row counter. There are several types available online, and I felt it was my duty not to copy another design, but to create a unique type from scratch. There's a beautiful sock row counter made in metal rings and beads. It's visually appealing and sells. Unfortunately, I don't like that it's tiny. I have trouble sliding the rubber o-ring around. Making a bigger version would look funny to me. It would be more like a necklace than a counter. There's another popular type that is a bracelet. Once again, very eye appealing and a great seller. To me though, there are too many parts. I wanted something easier to create. I like simplicity. I started searching then over the web for different types of Abacus counting systems that aren't necessarily related to knitting. So were fantastically ornate, so simple and not practical. I finally ended on a design like this.. . They are different than all those I've seen with beads that slide back and forth, and therein lies the problem. The string used must be sturdy enough to last though multiple slides without breaking. I made three versions of the counter: one with crochet thread, one with fishing line, and one with jewelry wire. Next was the fun part, I took all three and played with them. I slid the beads around, swung it in circles, and gave it to the kids. For a couple of hours everyday I played with them. After beating them up sufficiently I checked them over to see how well they stood up to the abuse. The wire one was very stiff and pushed the beads crookedly. (Like the top sample.) Also, the wire broke relatively easy and frayed. Not good. The Fishing line worked out better. It was fine with the abuse, but the beads didn't slide easily, and as you can see in the photo, the beads didn't lie straight. The crochet thread was the best in my opinion. It hanged nicely and felt good in my hands. There was some wear on the string, but it didn't break. It did stretch a little, but not so much as to compromise the workings of the mechanism. So, in the end, I choose number three, and need to start making them. Next time you look around my store, think about all the things that you don't see me doing to make sure you get a good product. It's not always about finding the cheapest stuff, but the best constructed. I love what I do, and I hope you all love it too. Work I-cord for two (2) inches. Divide onto three (3) double point needles to begin working in the round. Work three (3) rounds of stockinette st.
Work in this pattern for another two (2) inches. Break yarn leaving 8" tail and weave tail through live loops. Pull tail tightly to close hole, and weave in all ends. To form loop on top fold i-cord down and use the tail to attach the top of the cord to the bottom where the tube starts. You can make it fit a belt by making the i-cord longer. Copyright 2009. Dawn L.E. Riden. These patterns are for personal and non-profit use only. You may not sell items made from these patterns. You may make them for yourself, as gifts, or for donation to charity sales or auctions. And these patterns love being used for knitalongs or other organized knitting events that are free of charge. Merchants may not download or print these patterns for sale, free distribution, or class use without prior written permission from the author . If you received one of these patterns directly from a yarn store, or are taking a paid class using one of these patterns, please verify that the store has written permission from the author. Phat Fiber, who brings together wonderful sampler boxes full of items from independent fiber, yarn, and related artisans, host several give-aways during the month. I must be on a streak of good luck because I was drawn to receive a wonder bag for my fiber and spindle from The Sleeping Spindle on Etsy. I love the funky mod fabric of the spindle bag that is cut longer, so it can fit wool and a spindle. She also included a delightful sample of some of her green and blue wool, Lauchlann, as well as a smaller bag that is perfect for storing little items in. She, of course, has several choices of fabric to choose from. So check her out! 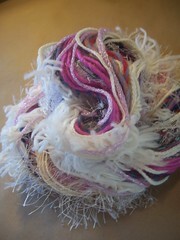 Like many spinners I know, I love to spin funky yarns just look at. 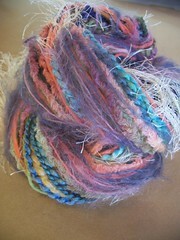 I call these art yarns. Even without being knit or crochet, they inspire one's imagination. I've had an epiphany recently. I love spinning yet never use what I spin. What do I do with the yarn. Give it away? No. Try to force it into a knit item? No. Then, I glanced over to my right where I keep all my leftover bits of yarn from various projects. Aha! I began to furious take some of this and some of that until I created a beautiful & unique skein that I was proud to sell and use. 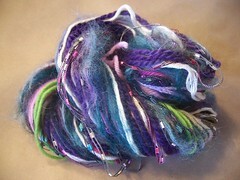 Within several hours I combined several stunning skeins that took my breath away!